I’ve been fascinated watching a Smithsonian Channel series that analyzes various plane crashes. And with the recent 737 Max in the news and piquing everyone’s interest in plane crashes, I thought a plane crash thread was warranted. I’ll post information here about famous plane crashes, and feel free to discuss. I’ll start with an unbelievable crash. 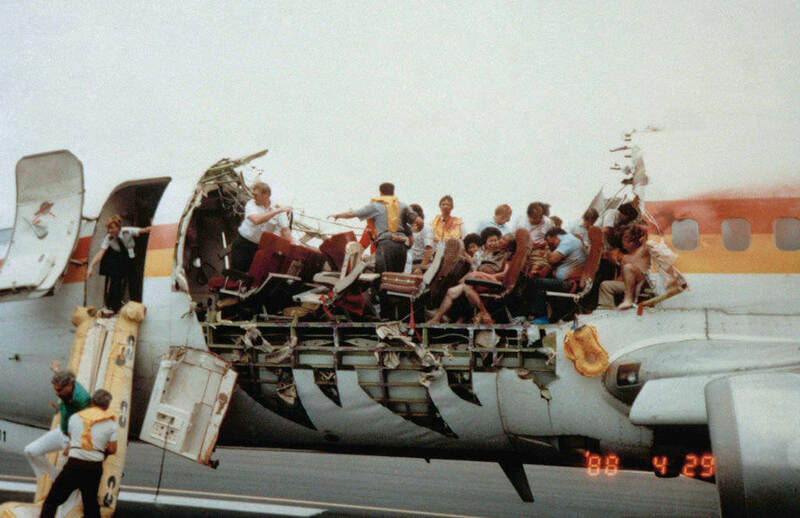 United 232 in 1989, which in mid flight blew an engine and lost all their hydraulics and thus most of the control of the aircraft, a DC-10 with nearly 300 souls on board. The pilots ended up controlling the aircraft with the throttle. A DC-10 training pilot was sitting in first class as a civilian and was called up to the cockpit to help (Denny Fitch, see video of his story below). Denny controlled the throttles while standing up between the pilot and first officer. They were headed from Denver to Chicago, but were flying over Iowa when their trouble started. They ended up crash landing in Sioux City Iowa. 185 people survived it (including all the pilots) while 112 died in the crash. Here’s Denny Fitch’s story of the crash (a fascinating story, he tells it well). The captain was Al Haynes, who showed great leadership in the cockpit that day. Grace under pressure. He was even (effectively) using humor in the cockpit during this unbelievably tense crisis. Read the cockpit voice recorder transcript here. The instructors show that United video every year in annual training at airlines. It is one of the biggest feats in aviation. Those three worked as a perfect team and accomplished the impossible. How about TACA 110? This is similar to the Sully ditching in the Hudson. They were flying a 737 from Mexico to New Orleans, and over the Gulf of Mexico, they lost all their engines. They glided to the edge of Louisiana and spotted some canals, and that was the plan, ditch it in a canal. As they were descending, the copilot spotted a levee (flat with short grass) and the pilot agreed that would be a better landing spot. He was lined up over the canal, so he had to slip it over at the last minute to line up on the levee. He landed there safely, no injuries. The pilot said that was his smoothest landing ever. But speaking seriously, this was incredible, the pilot landed using one eye. Great thread Dusty. Just in time for my flight next week! On the 1994 Fairchild AFB B-52 crash due to a reckless pilot. I probably should have called this the plane crash/incident thread, cause not all of these are crashes. Here’s an interesting incident. British Airways 5390 in 1990. The pilot’s windshield broke out, and he got sucked out the window. His crew was able to grab his ankles and keep him from his death. The pilot survived with only minor injuries and was back flying in no time. PSA Flight 182 has always fascinated me. Collided with an unseen Cessna while coming in for a landing over a residential San Diego neighborhood in 1978. 144 dead including the two in the Cessna and the people in houses on the ground. The crash was captured on video by a nearby cameraman who heard the collision overhead while working on another story. 09:01:51 Captain What have we got here? 09:01:59 Captain (to Lindbergh tower) This is it, baby! I lived in San Diego for a while and know the crash neighborhood well. There are a couple plaques there to remember the victims. The deadliest plane crash in history, where two 747s crashed into each other killing 583 people. Quote: The Tenerife airport disaster was a fatal runway collision between two Boeing 747s on Sunday, March 27, 1977 at Los Rodeos Airport (now Tenerife North Airport) on the Spanish island of Tenerife, one of the Canary Islands. The crash killed 583 people, making it the deadliest accident in aviation history. 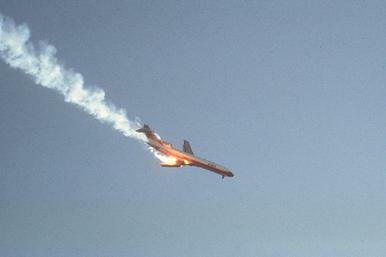 As a result of the complex interaction of organizational influences, environmental preconditions, and unsafe acts leading up to this aircraft mishap, the disaster at Tenerife has served as a textbook example for reviewing the processes and frameworks used in aviation mishap investigations and accident prevention. When Gran Canaria reopened, the parked aircraft blocking the taxiway at Tenerife required both of the 747s to taxi on the only runway in order to get in position for takeoff. The fog was so thick that neither aircraft could see the other, and the controller in the tower could not see the runway or the two 747s on it. As the airport did not have ground radar, the controller could find where each airplane was only by voice reports over the radio. As a result of several misunderstandings, the KLM flight tried to take off while the Pan Am flight was still on the runway. The resulting collision destroyed both aircraft, killing all 248 aboard the KLM flight and 335 of 396 aboard the Pan Am flight. Sixty-one people aboard the Pan Am flight, including the pilots and flight engineer, survived the disaster. (03-17-2019 06:00 PM)Dusty Wrote: Here’s Denny Fitch’s story of the crash (a fascinating story, he tells it well). That was a great and unforgettable video -- so much to say about it, but I'll just say this: if anyone wants to know what an American is -- the very truest, purest, deepest type -- let them watch this film from beginning to end and they'll have their answer. Thank you for posting, Dusty. It’s funny Lizard, when I watched that video the first time, I thought the exact same thing. The same with the captain, Al Haynes, who reminds me a lot of Sullenberger. Fitch sadly died from brain cancer in 2012. Haynes is still alive, he’s 87 now. He’s given thousands of speeches on the accident, and donates all the speaking fees to charity. Here’s some audio of the cockpit voice recorder. I've binge watched every Air Crash Investigation/Mayday. I like how virtually every Soviet-era crash is something obscenely stupid like not understanding TCAS or letting a kid fly the plane. This one happened thirty years ago, but I remember. Aloha Airlines. I don't know if any of you ever flew on Aloha, but it was the coolest airline ever. Then one day it just went out of business. I flew them a ton interisland. They were all 737's and those dudes flew them hard. And each plane made lots of daily takeoffs and landings. The runways are shorter and potholey. Maui, for example, was like they hads to hit the gas and do a full 180 to get enough speed on the main runway. I'm surprised this was the only accident. I thought you always wanted a convertible plane, Kona! One that happened near my hometown. USAir Flight 427...it was a 737 also. (03-18-2019 06:07 PM)Kona Wrote: This one happened thirty years ago, but I remember. Aloha Airlines. Yeah, that was a crazy one! The roof blew off at 24,000 feet and it sucked one of the flight attendants out and killed her. What a way to go. The other flight attendant dropped to the floor and held on for dear life to a seat mount. I think some of the passengers held her down too. The passengers weren’t blown out because of their seatbelts. The pilot landed that sucker safely. The pilot and copilot couldn’t hear each other due to the noise from the wind, and used hand signals to communicate. At 2:25, you see the survivors shaking the pilots hand. (03-18-2019 06:12 PM)IveBeenFramed Wrote: One that happened near my hometown. USAir Flight 427...it was a 737 also. I knew a family whose father passed away in that one. I think that one led to Boeing fixing some faults with the vertical stabilizer. RIP. Here's another Hawaii plane crash. A guy on the plane Gopro'd it. They are state employees on the plane. They went to Kalaupapa on Molokai. It's only accessible by planes like that, or donkeys. It's also a weird and spooky part of the world. Its where the last remaining lepers live, they don't want that spreading, so it's isolated. Interestingly, the only person who died was the director of the state health department. She so happens to be the lady who verified Obama's birth certificate. Some say the crash was a conspiracy, I say its the evil leprosy spirits cursed the plane. Like I said its spooky over there. Cargo plane crash in Afghanistan in 2013. Quote: National Airlines Flight 102 (NCR102), MSN 25630 - N949CA, was a cargo flight which crashed shortly after taking off from Bagram Airfield on 29 April 2013, killing all 7 crew. The aircraft involved was a Boeing 747-428BCF registration N949CA, c/n 25630 It was manufactured and first flown in 1993. The aircraft that crashed was branded as National Airlines although it was actually operated upon the operating license of Air Atlanta Icelandic for National Air Cargo until 2011. Upon this particular sortie, Flight 102 was flying on behalf of the Air Mobility Command. 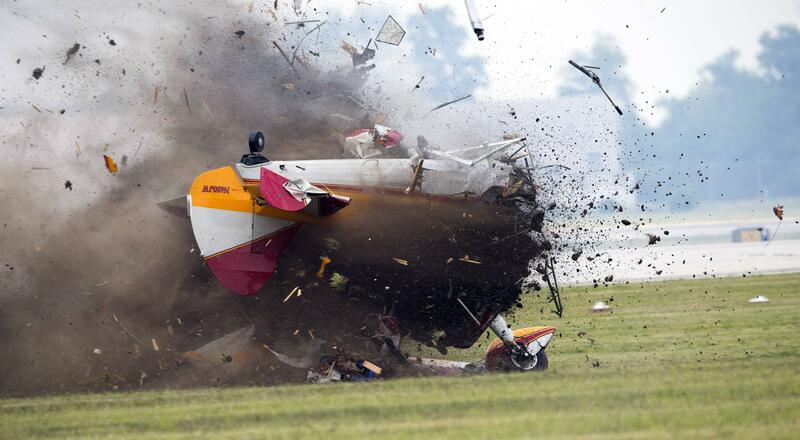 Stunt plane with a wingwalker crashed at at an air show. I think I read that the pilot came in to hard on the descent and had to take the plane into the ground to avoid crashing into the stands. I can't imagine being a spectator and seeing this. There are some pretty intense photographs of the moment of impact where you can see the stunt lady's body right before it gets reduced to pulp. Mod feel free to remove if this is considered too "graphic"
Quote: The hijackers demanded the plane be flown to Australia. Leul tried to explain they had only taken on the fuel needed for the scheduled flight and thus could not even make a quarter of the journey, but the hijackers did not believe him. One of them pointed out a statement in the airline's in-flight magazine that the maximum flying time of the 767 was 11 hours. Leul attempted to land parallel with the waves instead of against the waves in an effort to smooth the landing. Seconds prior to contacting the water the aircraft was banked left some ten degrees; the left engine and wingtip struck the water first. The engine acted as a scoop and struck a coral reef, slowing that side of the aircraft quickly and causing the Boeing 767 to suddenly tilt left. The rest of the aircraft then entered the water unevenly, causing it to break apart. Except for the rear part of the airframe, the broken portions of the fuselage sank rapidly. Many passengers died because they inflated their life jackets in the cabin, causing them to be trapped inside by the rising water. The pilot in that ditching did an absolutely miraculous job of water landing that 767. Seriously. 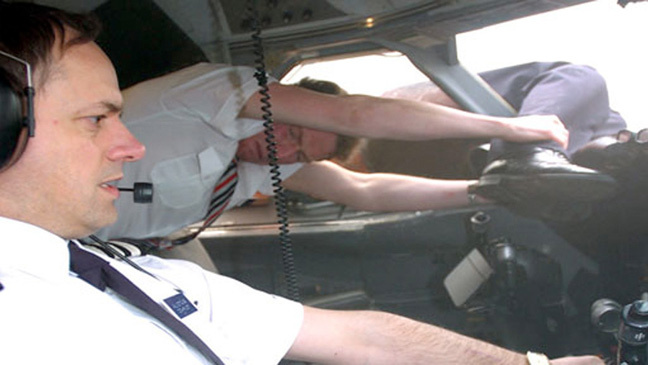 We’ve been featuring a lot of cases where very skillful pilots made unsurvivable situations survivable. But there are some examples of some astonishingly inept pilots that ended up killing people due to their incompetence. One such example is Asiana 214 crash in San Francisco in 2013. The “Wee tu lo” crash. The SFO airport was doing some maintenance on their glide scope, and had it turned off which the pilots knew about before they left Korea. The glide scope is technology at airports that send out a signal to arriving aircraft to show them exactly the path they need to be to make a landing. The pilot of Asiana 214 was nervous before takeoff about landing without the glide scope, but said nothing. Though experienced on Airbus airctafts, he was still relatively new to the Boeing 777. The Copilot was a training pilot and was observing the captain and evaluating him. He didn’t take over as he should have. So, on approach they at first came in too high. The pilot over adjusted and then was on a too low landing path. It sounds like the pilot was panicking and not knowing what he was doing in 777, inadvertently turned off the auto throttle and he was expecting the auto throttle to correct his speed. They were too slow and too low. They tried a go around, but it was too late. Three people died. Over 300 survivors though. This animation shows their glide path with another plane showing the correct approach path.